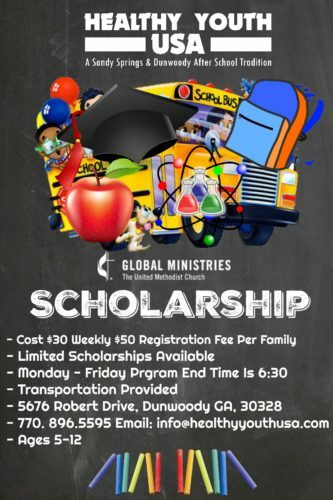 The Healthy Youth USA After School Program in Partnership with Global Ministries is currently offering 38 After School scholarships for The After School Club Program 2018 – 2019. Recipients will receive tuition assistance for a full calendar year beginning March 5, 2018 – Feb 28, 2019. Please note regular attendance and proper behavior is required to maintain scholarship status. A child receiving a scholarship is expected to attend the After School Program at least four days per week. If attendance drops below four days a week, the scholarship eligibility will be revoked and givien to another student in need of full week. Additionally, recipients must adhere to the regulations, policies and procedures in the Healthy Youth USA After School Program Parent & Guardian Handbook. If the scholarship is revoked; you may elect to continue with the program at the regularly scheduled rate. Please ensure all required documents are attached and all sections of the application are completed; incomplete applications will not be considered. Free/reduced lunch documentation and will also be verified by school. Please note scholarships will be reviewed and awarded based on availability of donation funds. Recipients will be selected according to financial need and merit. All applicants will be notified via email of application status by FEB 28, 2018. Scholarship recipients will begin program Monday, March 5th, 2018. Download application at www.healthyyouthusa.org. Please return application with all requested documents to Healthy Youth USA , located inside North Atlanta Enrichment Center, 5676 Roberts Drive, Dunwoody GA 30338. Open daily 2:00-6:30pm. Complete application and return to Healthy Youth by Feb 28th.